I was in a sporting goods store yesterday and noticed a rack of boys' t-shirts with Superman and Batman chest logos on them. Some neat colors and materials but a bit small for an adult. Then I came across a rack of adult athletic shirts in the exact same styles. Plus they also had one with a Captain America shield. 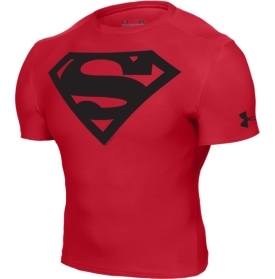 These were all nice shirts that were specially designed for running and I can totally see the appeal of sporting a Superman S-shield while you're, say, running a marathon. In fact, it's past time the running gear industry caught up with the biking wear people when it comes to licensing like that! What I'm wondering, though, is why they didn't have any shirts with the classic Flash lighting bolt emblem? Seems like a no-brainer to me! I mean, that's his whole shtick - he runs. He runs very fast. Wouldn't that be precisely what a real life runner wants to emulate?